The World Series Champions are presented the Commissioner’s Trophy for their achievement. There is a permanent trophy which is kept in the Hall of Fame, and a travelling trophy which the Champions keep until the following season. 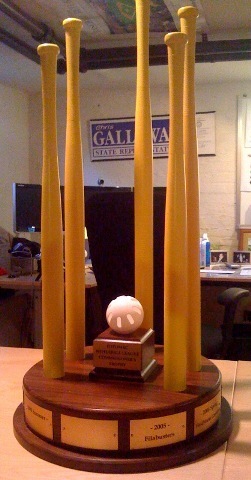 The trophy features five wiffleball bats, representing the original five teams that formed the league in 2005, reaching towards the stars, as so many of our players have. The bats encircle a wiffleball, shaped like a globe, representing the worldliness of the game and the contribution plastic balls have made to advancing world peace. Except for the initial 2005 season, each Division Championship Series and World Series have been a best of three game series. The higher seeded team in each series gets home team advantage in Games 1 and 3 of the series, and gets to choose the field used for those games. In 2011, the playoffs were expanded to six teams, and an additional round of Division Championship Series were added to accommodate the extra teams. Six team have won the Championship over fifteen seasons. The Canvassers have won five titles, the Blandsford Barnburners have won four, and Superman’s Wheelchair have won three.